The home was originally located in rented accommodations in Cajamarca, a small city in the northern Andes Mountains. Because of difficult accessibility – it was 13 hours by car from Lima – the home was relocated to a rental site in Lunahuaná – closer to the capital – in May 2007. The children moved to the permanent site, Casa Santa Rosa, in October 2011, although construction is ongoing. 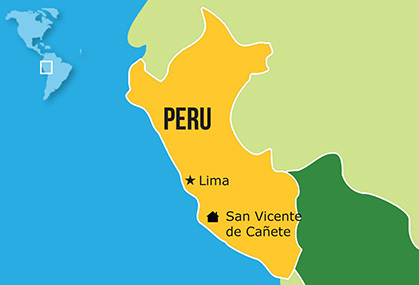 Peru is the first country in South America to have an NPH home. Each of the family-style homes is designed to accommodate 16 children and two caregivers. A leadership group plans special events, assists new children with the adaptation to living at the home and serves as mentors. The school year begins in mid-March. The children currently attend local schools. Many had never been to school prior to joining NPH. A special education program was added in 2015. A bakery, which is the home’s first vocational workshop, was completed in 2016. It will provide the opportunity for youth to learn a valuable trade, as well as provide bread for the home. In 2018, children began attending dance and music lessons three times a week to learn regional cultural traditions. Corn has been cultivated as feed for livestock and to generate income since 2017. Currently two hectares are producing 70 tons of corn about every four months. The NPH OneFamily program was launched in 2018 with home visits, family awareness sessions and a parental training program. Peruvian law prohibits us from using photos that show the faces of minors.